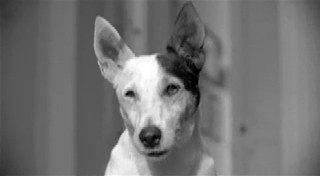 So why is that non-U.S. based commercials are so much better/stranger/odder/funnier/quirkier? Hmm...oh yea. It's because they're "foreign." And there's that whole different culture thing. The altered sense of humor. Reference points are different. The environment is different. The language is different. Or. Maybe they just make better commercials than we do. Or weirder ones. This one's from DDB Stockholm and it's for McDonald's. 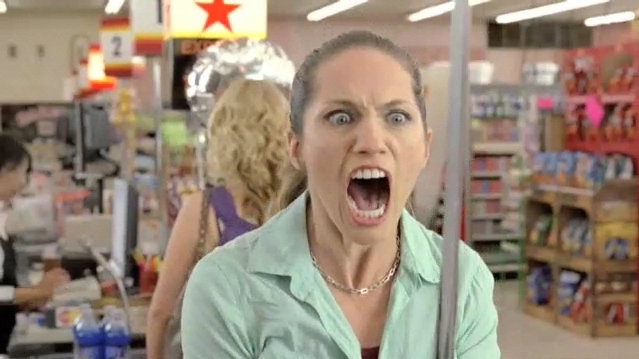 Yea, we know moms (yes, we are making that assumption) can sometimes get violent at the checkout counter but these two women take violence to a new level in this Mountain Dew Level Up or Die spot for the brand's Game Fuel. The work was created by BBDO New York with visual effects from Zoic Studios. Someone Just Poured A Beer on Our Head! Whoa. It's Tuesday morning. We love beer and all but we prefer to drink it rather than have it poured over our head (as one idiotic co-worker once did while at an end of the summer party). But we're not complaining. No. Not at all. Because the beer that was just poured over our head...is an ad. 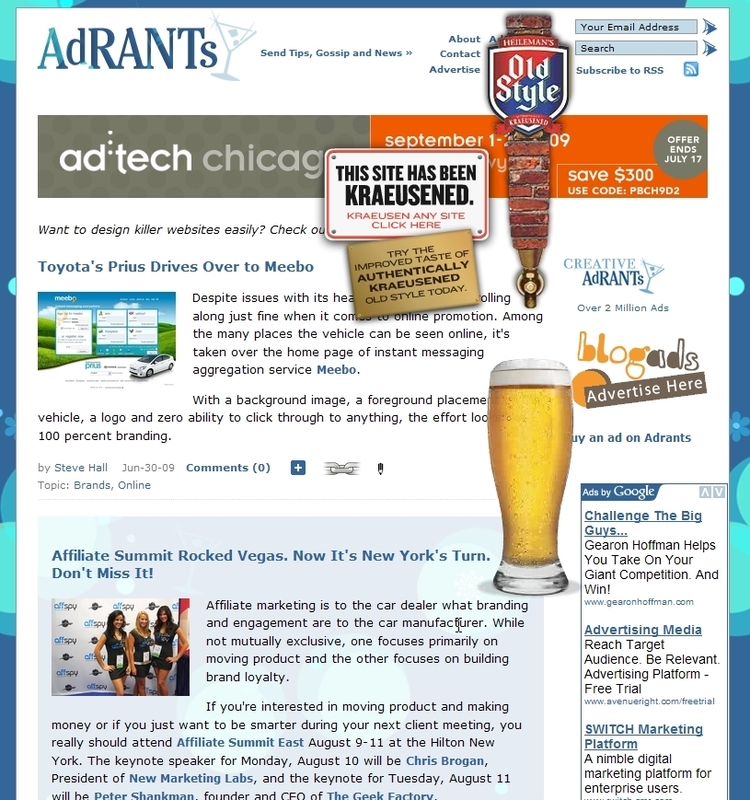 And we love advertising here on Adrants! And it's virtual so we really don't have beer all over our head right now (but did when that idiot did it in real life). Yup. Check this out. See? Pretty sweet, right? No go here and Kraeusen your friend's site compliments of Old Style. Soccer ball? Nope. Stuffed animal? Nope. Baseball glove? Nope. Squeaky toy? Nope. Slipper? Nope? SPDR Bone from State Street? Yup. And becasue this is advertising, the whole thing's an homage to the French film Breathless. 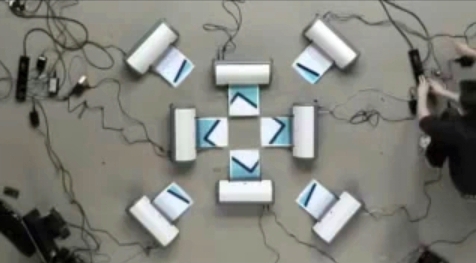 The Gate Worldwide created the work. After running into Keith Lane, a creative director at an agency I used to work at, Emerson Lane Fortuna, at the Boston AdClub Reunion, we did the required social media hook up on Facebook. Then, upon reading his Wall, I hilariously discover he's got as jaded a view of social media as I do. 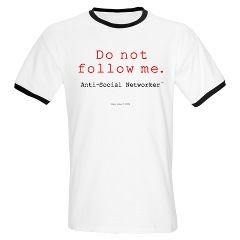 So much so, he's gone an created a line of CafePress-wear entitled the Anti-Social Networkers. The line hypes what Lane dubs the three most overused words of the year: friend, share and connect. 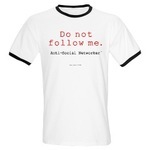 Headlines indlude Do Not Follow Me, Linked Out, Zero Connections, Do Not Follow Me and more. And, yes, there's even a thong. On Facebook, Lane's Daughter Courtney commented, "friggin' genius!! but quick question: was it your idea to have thongs??" to whick Lane responded, "Validation from my first born anti-social child. Thanks, Court. You made my anti-social day. The thongs? No comment. Love, Dad"
Dad and daughter talking about thongs on Facebook. Bet Keith didn't foresee this when he held Courtney in his arms swaddled in a baby blanket. For DESIGN: "Paper Battlefield" for Nike Hong Kong by McCann Worldgroup/Causeway Bay. 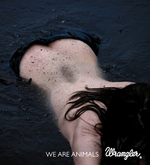 For PRESS: "We Are Animals," that creepy bejeaned-human-meets-carnal-instinct campaign by FRED & FARID/Paris for Wrangler. For CYBER: "Best Job in the World" -- which is seriously cleaning up this year -- by Cumminsnitro/Brisbane for Tourism Queensland. "Eco:Drive" by AKQA/London for Fiat also scored a Cyber Grand Prix, as did "Why So Serious?" for Warner Bros.' The Dark Knight. The latter campaign is a typical piece of elaborate genius by the folks at 42 Entertainment/Pasadena, whose every project is not so much advertising as it is grand oeuvre. Calling attention the to the practice of plumping, injecting chicken meat with salt water to increase size, weight and cost, Foster Farms has launched Say No to Plumping, a website that features two chickens, Betsy and Martha, talking to each other about plumping as if it were a botox treatment. 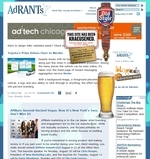 Goodby Silverstein & Partners created the work. The site also includes plumping facts and figures, how to detect a plumper, links to health resources and an interactive "Plumpinator" calculator to help site people calculate how much money they waste on saltwater from plumped chicken each year. Seriously. If we all just stepped back and took a look at the idiotically stupid, inane and unhealthy things we do as humans simply to make an extra buck or two, we'd actually laugh. Seriously. Injecting chickens with water to make them...what...taste more like water and less like chickens? Are we really that idiotic?